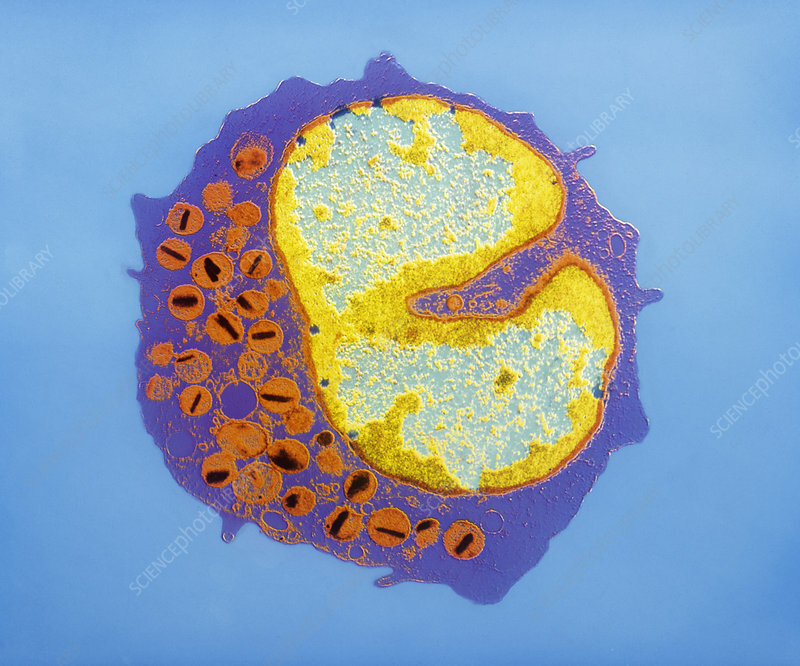 False-colour transmission electron micrograph of a section through an eosinophil, a type of white blood cell. Eosinophils possess a large bilobed nucleus (left, yellow & blue) & a cytoplasm packed with specific granules (orange circles). Each granule contains a dense crystalloid of uncertain function & some enzymes, including histaminase. Eosinophil numbers increase in certain parasitic infections & notably, in asthma, where the cell is now regarded as the most important inflammatory factor in tissue damage. Toxic concentrations of eosinophil products have been identified in asthmatic lungs. Magnification: x3125 at 6x4.5cm size.